In March 2018 OLEDWorks launched its first flexible OLED panels, branded as BendOLEDs. The company now announced that the panels are now commercially available - and rebranded as LumiCurve Wave, which is the first panel in OLEDWorks LumiCurve product family. 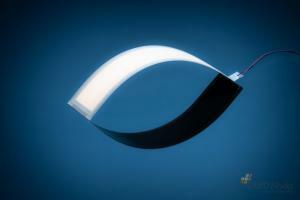 The LumiCurve Wave is produced on Corning's 0.1mm thin Willow Glass flexible glass substrate. OLEDWorks says that the Wave panels are extremely thin and light and deliver the superb light quality and excellent color rendering that is uniquely achievable with OLED. The Wave FL300C panel offers up to 300 lumens of brightness, and it offers an efficacy of up to 62 lm/W (at 100 lumens), a lifetime of up to 50,000 hours (again, at 100 lumens) and a CRI of 90 R9 50. The panel can be curved to a minimum radius of 10 cm. The Wave is available in a warm white (3000K) model and a neutral white (4000 K) model.